May 5, 2018 at 12:05a.m. 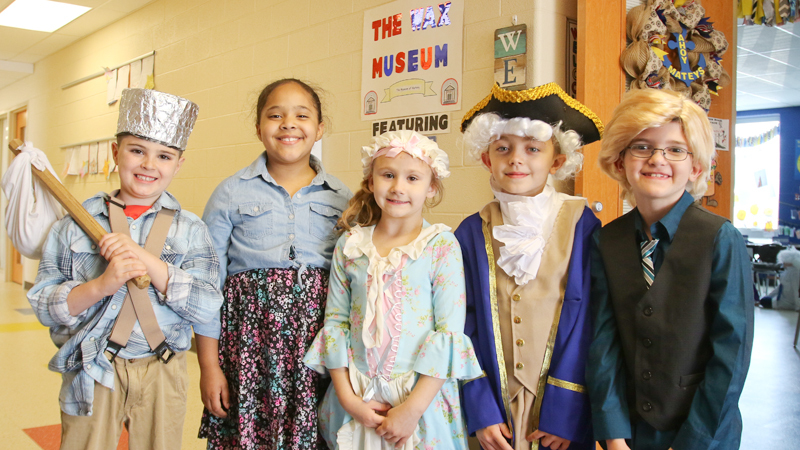 Austintown second-graders showed their historical knowledge this week at Austintown Elementary’s annual Wax Museum Show. “It’s the biggest project of the year,” said second-grade teacher Jackie Moretti. Students are tasked with picking one person in history to represent in a presentation for their parents. They hold “buttons” for parents to press to begin each student’s skit made up of a summary of their character’s life, a visual representation of the character’s contribution to the world and persona in general. Moretti said the preparation is intense for the event as her 21 students practice their speeches until they are memorized. “They not only get to learn about their people, but their classmates, as well,” she said. Characters included Albert Einstein, Steve Jobs, J.K. Rowling, Thomas Jefferson and more. Jordan Duzzny dressed up as President Donald Trump for his part in the museum. “I like sharing my speech,” Jordan said. He also enjoyed learning about the current president. “I learned he used to get in trouble in school and is going to be 72 next year,” he added. Down the aisle, Betsy Ross, also known as second-grader Anna Drozdik, proudly displayed the American flag. “I get to tell people that she made flags for the United States of America,” she said. But Nataliah Jackson, who represented Rosa Parks, most enjoyed dressing up. “It’s nice pretending to be people and talk about what people have been doing in history,” she said. May 4, 2018 9:55 p.m.
May 25, 2018 12:04 a.m.